This spring, 300 seventh graders from West Junior High in Boise will “travel” to New Orleans on a virtual field trip to the National World War II Museum. Thanks to the vision and efforts of World Studies teacher Paige Somoza, a new Tandberg 990 Video Conferencing System will be installed in the West Junior High School Library that will transport her students to another time and place. Mrs. Somoza was one of 12 Idaho educators awarded funds from telecommunications giant CenturyLink’s “Innovative Uses of Technology in Education” grant program. In her fourth year as a World Studies teacher (she also taught three years of French), Mrs. Somoza took a class on grant writing as part of her Master’s in Educational Technology. She discovered a potential answer to her dream with the grant opportunity from CenturyLink. On Monday, April 30, seven groups of Mrs. Somoza’s students and those of fellow World Studies teacher Rich Richardson will rotate in 45-minute sessions through the West Library as a museum guide nearly 2,000 miles away takes them on an exploration of A Day of Infamy: The Japanese Attack on Pearl Harbor. The students will return from their trip with a deeper understanding of the conflicts and lessons learned from World War II, and the West Library will await the next virtual journey. With video-conferencing equipment in place, librarians and teachers at West are thrilled with the potential for future field trips, virtual classes, staff training, author visits, and more. In June of 2011 the Boise Public Library launched its YouTube channel with a modest number of videos and screencasts. As of this writing (September 2011) there are nearly 25 items and several more awaiting approval. Collectively they cover a wide range of promotional and instructional content and include patron testimonials, interviews with library and civic leaders, musical performances, and screencasts demonstrating library databases and self-check machines. The library had been storing a dormant channel for over a year but it wasn’t until the involvement of the Library’s 2011 Innovation Table, a special committee charged with generating and implementing an innovation within the library during its one-year term, that the Boise Public Library made the leap to launch the channel. The germ of the idea grew from a proposal to film patron testimonials. Committee members felt that more could be done to promote the library with technology while also providing instructional content. A very modest beginning involved a library-owned Flip Cam and $14.95 for a Jing Pro license. With these tools Innovation Table members produced and edited several videos and a screencast to present to the Library’s Management Team in the form of a proposal, which netted enthusiastic response. Reassessing, it was quickly obvious to the group that the Flip HD would not provide adequate audio quality so we received authorization to purchase a Canon Vixia HFS 20 as well as an Audio-Technica ATR 6550 external condenser microphone. In addition, editing software was acquired in the form of an Adobe Premier Elements license It should be understood that the Innovation Table did not consist of a hand-selected staff of technology experts but merely a cross-section of managers, librarians, library assistants, and department specialists who were eager to learn and contribute. The first group of videos produced fell into two categories. The first consisted of patron testimonials where random patrons were approached in the library and asked if they would be willing to answer a few questions about their use of the library on camera for the Library’s newly-launched YouTube channel. A surprising percentage were amenable to the idea and Innovation Table members became adept at developing leading questions and drawing out informative answers as well as utilizing the camera and handling the microphone unobtrusively (as well as learning to hold it toward ones own mouth when one is asking a questions and towards the patrons when they are answering said question). What brings you to the Library today? What is your favorite book/movie/CD and why do you like it? What else could the Library offer? Are you an E-book reader? If so, do you prefer E-books to traditional books? How important do you think the Library is to the community? Why? Tell us about your best customer service experience at the Library? What is your favorite area of the main Library? What improvements would you suggest for our library? How does the Boise Public Library compare to other libraries youve visited? How would you describe Boise Public Library? The second category of initial Media projects were promotional and determined based on monthly library events and activity calendars. Summer Reading was just getting started and so we arranged to interview a staff member about the features, events, and important dates pertaining to the event. An Innovation Table member eventually developed a calendar of monthly events to monitor for possible media promotion, either through videos or screencasts. In order to maintain quality for published material we had a handy and effective gatekeeper for posting videos live the Library’s Community Relations Coordinator. She either signed off or made constructive comments after videos were edited. Instructional screencasts, being outside of her bailiwick, were simply posted after Innovation Table review. It should be noted that there is a healthy by-product of this Innovation Table idea: development of unconventional skills of video recording, editing, interviewing, and screencast by the library staff members who participated. Clearly this endeavor, while satisfying to launch could not possibly be sustained or evolve without committed and skilled staff members. Perhaps the most important ongoing contribution made by the Innovation Table was the proposal of a Media Production Team for the library to consist of three individuals, ideally people who were available, enthusiastic about the assignment, and skilled on some level with tools such as Adobe Premier, Jing/Camtasia and the like. The library director agreed to this proposal and a Library Media Production Team will be selected and functioning by mid-November 2011 to guide the Channel and grow its contents for the next generation of scalable library content. Ultimately, the number of gatekeepers for content, beyond Community Relations Coordinator, needs to be reviewed as it will also be necessary (indeed, already has been necessary) to swap out stale content and revise screencasts when database interfaces change or new features of technology are implemented library-wide, as is the case with our self-checks. Constant maintenance is required of the channel. If we avoid this maintenance our customers will quickly ignore the Potemkin village we created. In the 2nd video, local author Katy Robinson is being interviewed amount writing, libraries, and growing up in two cultures. Jim Jatkevicius was a long time Adult Services Librarian and now Branch Supervisor at the Boise Public Library’s Library! at Collister and has written about library topics in Online Magazine, EContent, College & Undergraduate Libraries, Public Libraries, Public Library Quarterly, and Library Administration & Management (now Library Leadership & Management). “Librarians are cool!” “I want to work here when I grow up!” Librarians in the Children’s Room at the Boise Public Library (BPL) used to find comments like these unusual. When those librarians began to use iPads for reference in the spring of 2011, things changed. The Youth Services (YS) division at the Boise Main Library has seen major changes in the last year. Besides the colorful paint, new carpet and a more open look, the division implemented a new approach for providing reference service. In 2010, librarian Tobie Garrick authored an LSTA Just-in-Time grant, which allowed YS to acquire several iPad 2 tablets for roving reference. The total amount of the grant was $6,700, of which $3,300 was used for iPads and accessories. LSTA is the Library Services and Technology Act, a federal program administered through state libraries such as the Idaho Commission for Libraries. For more information, visit http://www.imls.gov or http://libraries.idaho.gov/landing/funding. The goal of the grant was to increase staff interaction with customers by giving librarians tools to move out from behind the desk. The physical reference desk area has been minimized: rather than two librarians sitting down waiting for questions, there is now one stationary staff member and during busy times, one or more roving. Grant funds were used to purchase four tablets and a variety of accessories. The most popular items are permanent hand-grips affixed to the back of the units, a barcode scanner, a full-size wireless keyboard dock, Smart Covers, and a shoulder bag holder. Each accessory was tested by two or more librarians, and most have proven helpful to at least one staff member. Librarians received the new iPads in March, 2011. Each reference desk staffer was encouraged to use the devices both for reference and collection maintenance tasks as often as possible. All nine staff members experimented with the iPads for a period of approximately 4-6 weeks. While there was limited formal training, staff members worked together to solve problems related to the use of the new devices. There were varying degrees of satisfaction with the devices themselves, the accessories, and the learning process. Five staff members had used touchscreen mobile devices outside of work. Using the catalog on the mobile device was new to these users, but not completely unknown. Four staff members had no previous relevant experience, and relied heavily on colleagues’ experience and advice. For these inexperienced users, there were many hurdles to overcome before becoming proficient with the units. There are several major advantages to using iPad technology for reference. The primary benefit is being able to access the catalog without being tied to the desk. Customers sometimes do not come to the desk and ask for help, even if they have questions. A librarian walking through the stacks may seem available to answer questions in a way that someone working at a desk may not. When that librarian has a mobile catalog in his or her hand to aid in answering the customer’s queries, the interaction is that much more useful. With four iPads, multiple librarians can access the staff features of the catalog simultaneously. This is a helpful when large groups visit the library, or when many customers ask questions in a short time frame such as before or after popular programs. Other libraries have used iPads to demonstrate multimedia and web information to their customers. Lotts and Graves (2011) reported on implementing iPads for reference in a university setting. They noted that functions such as the eBook reader, a dictation tool, a calculator, and music players have been useful reference tools in their academic library (p. 219). These functions were not tested in YS. The pilot project implemented by Youth Services has inspired staff in other areas within BPL to incorporate tablets into their service models. The Circulation division, for instance, hopes to improve customer experience at the self-checkout machines. A staff member with an iPad could diagnose account problems on the spot, sparing the customer a wait in line for assistance at the main circulation desk. Unfortunately, there are still problems to be worked out with using tablets for reference. Horizon Information Portal, a SirsiDynix product, is the web-based public access catalog used by BPL. It is not optimized to work with mobile devices. BookMyne, a mobile application developed by SirsiDynix, is available for accessing the catalog, but staff functions such as placing holds and viewing detailed holdings information are not available. In the absence of a mobile application, the iPad’s touch screen is not used optimally. For example, selecting an item in a list requires scrolling. Librarians zoom in to make the scroll bar big enough to use, then zoom out to view the result. While this seems trivial, when the task must be repeated several times in a single search it becomes time-consuming and frustrating. A virtual desktop infrastructure program such as Citrix is required for mobile access to the Horizon staff functions. At BPL, Citrix has a tendency to cease functioning, or “hang up,” periodically. Librarians first wait for the program to respond, then spend precious time trying to ‘fix’ it, and finally close the program and log in anew. Customers wait while these machinations are going on, sometimes expressing frustration at the delays. The mobile devices are configured to power down after three minutes of no use, in order to comply with existing library and city regulations. Unless data are entered or the screen display changed every couple of minutes, the catalog application closes. Ergonomic issues are of potential concern. Despite being relatively light, the iPad 2 places stress on hands and wrists as it is carried. Typical use is standing: the device is held in one hand while the user is typing with the other. Using the device for 20-30 minutes at a time can be difficult. In addition, typing is slower with the on-screen keyboards than with a standard keyboard. The full-size keyboard dock is useful for stationary functions, but an early idea of having docking stations at throughout YS proved unworkable. Some complaints expressed by librarians relate to unfamiliarity with various functions. Switching back and forth between applications is difficult for new users, but experienced users do it with ease. Cutting and pasting text, a simple process on a standard computer, takes practice and some helpful hints on the iPad. Linking the iPad to accessories via a Bluetooth wireless connection takes patience and practice. Only one text input device can be connected at a time. For example, it would be ideal to use the barcode scanner and the keyboard simultaneously, but each requires a Bluetooth text input. Finally, as tempting as it is to walk toward the stacks while typing on the tablet, the risk of tripping or dropping the device precludes typing while walking. The iPad has great potential for service provision in library settings. Ideally, each librarian would have her or his own unit, allowing for personalization of the apps and other customization. The mobile devices would be ideal for off-site events promoting the library. Library card sign-ups, demonstration of website functions, and readers’ advisory could be provided. BPL librarians have used the iPads in some of these capacities, and have found the technology to add value to their presentations. Garrick, T. and Smith, B. (October, 2011). “May I (and my iPad) Help You?” Presented at the annual meeting of the Idaho Library Association, Boise, Idaho. Retrieved from http://www.idaholibraries.org/conferences/2011. Lotts, M., & Graves, S. (2011). “Using the iPad for reference services.” College & Research Libraries News, 72(4), 217-220. Retrieved from http://crln.acrl.org. Fiona May is a Library Assistant in the Youth Services Division of Boise Public Library’s main downtown branch. Data on ebooks is beginning to show that this format is transforming the library world. More and more libraries are developing ebook collections and patrons are learning to expect this format as an option. Much of this success is the result of devices like the Kindle and iPad which mimic a much more natural reading experience, at least in the traditional sense. Reading a novel or any text straight through works well on these devices. However, not every type of reader interacts with a book like this and in fact many academic faculty and researchers need more freedom to read in ways that support their individual research practices. These techniques enabled readers to more deeply interact with and understand the text, drawing attention to key points. Decades later, readers are still using these strategies, especially in university settings. However now, students and faculty also use highlighters, post-it notes, flags, paper clips and a variety of other tools that are easily available at office supply stores. Scribbling questions and comments in reaction to what I am reading either between the lines or in the margins. I’ve also picked up the habit of jotting down a list of “To Do’s” some where on the book or paper. Groceries, pending emails, or other distractions are quickly recorded and forgotten so I can get back to what I’m reading. No one ever taught me these techniques. I just began using them because they worked and now that’s how I tend to work through a book or paper. If the miscellaneous highlighters, post-it notes, and occasional textbook found around our library are any indication, many of our patrons use similar techniques as well. I began thinking about how I read, particularly non-fiction, this past spring when I was provided an iPad to use for work. Our library has been making a concerted to enable employees to utilize mobile technology when providing services to our patrons. The importance of having these skills was reinforced this summer as the library launched two new ebook platforms, EBL and Overdrive. I had heard mixed reviews about reading on an ereader, but I knew it was important to be able to successfully work with the technology. I actually found reading a novel on the iPad to be a great experience. Backlighting so I could read in the dark. Reflowable text that I could enlarge whenever I took off my glasses. Multiple books in a light weight device that I could slip in my bag. Instant access to books. It was great. Despite my pleasure at being able to catch up on some summer novels, I discovered that reading non-fiction was a different matter. My typical marking techniques had to be adjusted or weren’t possible in this new environment. One of the professors I work with who tried an EBL books also noted similar issues, stating he wasn’t certain how effective an ebook would be for “serious research”. Highlighting gives the reader a way to draw their attention to a specific section of text. It creates emphasis and designates a phrase or passage as important. Ebook highlighting is limited though as it only provides one type or level of emphasis. Highlighting and adding emphasis in a print book can take many forms as I noted in my own active reading techniques. Having the ability to annotate a book is an important feature. It gives the reader an opportunity to critically analyze the content and relate the concepts to their own ideas. Again, notetaking was available on all ereaders except Overdrive. (Note: With the availability of Kindle ebooks through the Overdrive platform, readers can now add notes to those books via their Kindle app.) Although all ereaders with notetaking options allowed users to edit and copy their notes to another app or tool, the presentation and access to those noted varied. Some readers, such as iBooks and Kindle, provided a visual indication through small note icons that a comment had been added to a section of text. Both Bluefire and Nook did not provide any kind of icon, but the associated section of text was highlight when a note was added. Each ereader allowed you to skim through and navigate to the notes through a list feature found in the table of contents area. None of the ereaders allowed batch exporting of notes and when a single note was copied and added to an external document, no citation information was transferred. In an ebook environment, bookmarking can serve as a wayfinding device, but it can also add emphasis to a section of the book. However, unlike a post-it or flag which allows the reader to specify the specific point in a page where they are stopping or should look again, bookmarks in ebooks are limited to a single page as a whole. Every ebook provided a bookmark feature, always in the upper right corner. Except for the Bluefire Reader, adding and removing a bookmark was a simple process of tapping the bookmark icon. In the case of Bluefire, readers had to bring up the basic ebook toolbars, touch the bookmark icon which then brings up a notes box. You can add a note or simply select save which then creates a bookmark. Although this method does allow you to add a bookmark, it is much more intensive process in comparison to the other ereaders. In every situation, readers could view, via the table of contents option, a list of bookmarks and navigate to a specific point in the book. Each ereader also allowed users to add multiple bookmarks which where associated not with a specific section of text, but with the page as a whole. When researching, being able to move back and forth between different sections, referencing previous content, is critical. 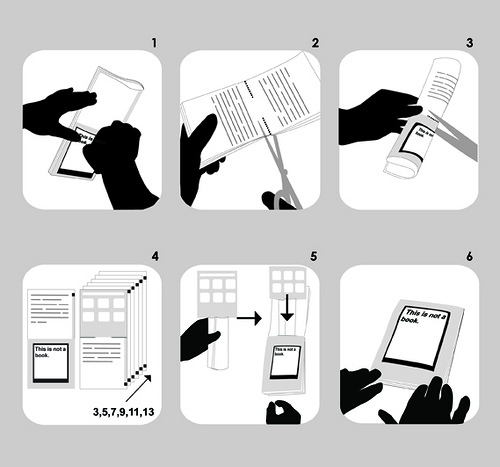 Although ebooks try to simulate the page turning experience, other devices have been developed to assist researcher in being able to jump back and forth between sections. In addition to “turning the page”, all five readers provided access to a table of contents and had a slider tool which allowed readers to quickly move to a specific point in the book. When bookmarks, highlights, and notes were added, these also became tools for navigation, usually through a list found in the table of contents option. Depending on the format of the book, some books also contained internal hyperlinking. With the exception of Overdrive, the ereaders also provided access to a search tool on every page. iBooks, Kindle, and Nook all have the option of search on a term by highlighting, as well as looking the term up in a built in dictionary, as well as in Google and Wikipedia. There’s no doubt reading a non-fiction book in an ereader is a very different kind of experience. Some of the tools and features work well, while others need further development to be of real value to researchers. Every ereader is unique and those variations can cause researchers to shift their active reading strategies from application to application. Instead of being able to pick up a book and start working, they have to orient themselves to the specific tool being used. Highlighting and note taking options work fairly well, but they are not able to replicate the experience of spontaneously writing in the margins and being able to see your comments right next to the text. Searching within a book, however, illustrates some of the greatest potential for using ebooks for research. Being able to quickly find a specific word or phrase, as well as all the corresponding references to the term, is amazingly efficient. The growth in popularity of ebooks clearly indicates how far the ereading experience has come. There is a tremendous amount of potential for ebooks to support researchers and some of the features described in this column are already doing that. As libraries continue to develop ebook services, librarians should advocate for tools which allow patrons to interact with these items in the way that best meets their reading needs. Michelle Armstrong is a librarian at Boise State University. She manages ScholarWorks, Boise State’s institutional repository and serves as a liaison to the Mathematics Department and Graduate College.